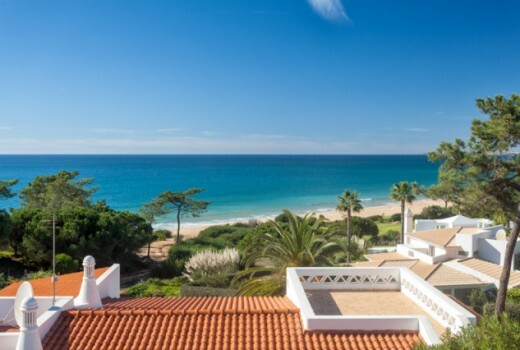 One bed first floor apartment with stunning sea views in the luxury Dunas Douradas Beach Resort. This apartment is fully air-conditioned and located just 30 seconds walk to the sandy beaches. The entrance leads to a large living/dining area with ample seating, satellite TV and underfloor heating. The kitchen is fully equipped with all modern conveniences including microwave, hob, dishwasher and washing machine. The spacious bedroom is a double and comes complete with two luxury ensuite bathrooms and dressing rooms. The terrace has garden furniture and stunning sea views. This luxury apartment is located just 2 minutes from the central facilities of Dunas Douradas Beach Club. As you would expect from an award-winning resort you can find a selection of indoor and outdoor pools, gym, restaurants, bars and much more. Originally two 2-bedroom apartments, this property offers luxuriously ample living spaces throughout this spectacular apartment.